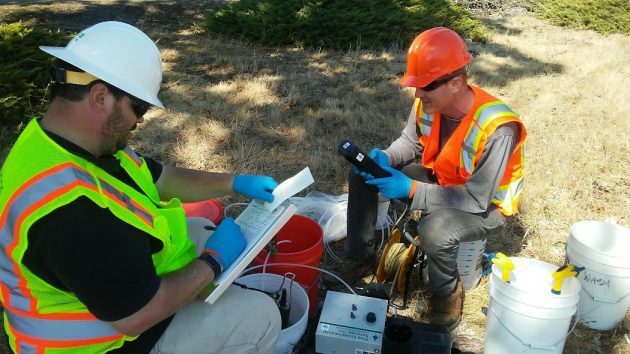 Technicians take readings Thursday at a monitoring well near the former gas station site at 3110 Pacific Blvd. S.E. A flurry of Facebook chatter in late August has prompted Albany city officials to take note of a former gas station site on Southeast Pacific Boulevard. Mayor Sharon Konopa says she would like the property better maintained or redeveloped. The property, about four-tenths of an acre at 3110 Pacific Blvd. S.E., is owned by BP West Coast Products LLC in Houston, Texas. It’s valued on the tax rolls at about $300,000 and assessed at $233,780. Last year’s property tax was $4,505. The place was the site of a convenience store and gas station — Arco, most recently — that closed in the 1990s. The building sat vacant until, at the city council’s urging, BP demolished it in December 2012. Compared to some other unused properties in Albany, the site lately has hardly been a big eyesore. Public attention may have been drawn to it again after the opening this summer of the big-box WinCo grocery nearby. I rode my bike past the place on Thursday. 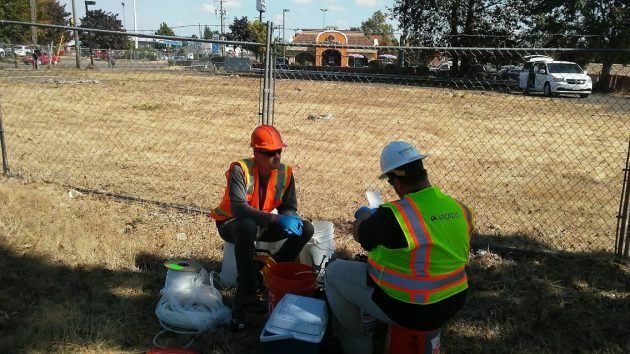 There I talked with two men working for Arcadis, a company with many branches including one that deals with contaminated sites. Carl (who wouldn’t give me his last name) and Tucker Thiesing had a probe sunk into a monitoring well on one side of the property and were taking readings of contamination under ground. Stretching out behind the data collectors, the BP site looks well mowed and cleaned up.